Aorta VI - ZineWiki - the history and culture of zines, independent media and the small press. Aorta VI is a Collective, featuring the work and collaborations of Jared Blunk, Pj Kneisel, Sam Graham, Tyler Stafford and Sean O'Brien. Their output is generally self-published minicomic work from Pj's house in Redondo Beach, California, U.S.A. There have been 6 zines and 5 minicomics released since August 2008 as well as a frequently updated blog featuring comic strips and other artwork. In July, 2012 Aorta VI announced a publishing deal with Shia LaBeouf's The Campaign Book and are currently working on the book Hotah. The name came about because Pj Kneisel came across both the band Aorta and the Roy Montgomery album Temple IV and since he had always been intrigued by medical terminology, Roman Numerals, and the occult implications of the number 6, the name was obvious. Aorta VI started in the Spring of 2008 as the brainchild of Jared Blunk and Pj Kneisel as they were goofing around in Math class at El Camino College. The two became fast friends and soon began collaborating on round-robin styled comics wherein both artists styles, though disparate, began to merge or "coagulate" as they like to say. The comics were profane and disgusting, featuring the gross-out style humor that tends to be in fashion with young men. Titles began to emerge such as The Indigestible Sperm, The Mildly Retarded Altar Boy, and The Faceless Man. Knowing they were onto something Kneisel and Blunk began theorizing a way to get the work out to the masses. An artist friend of Kneisel's, Sam Graham was introduced to the group and a melding of minds began to boil and bubble. Issue I was a long-form anthology zine released August 18, 2008 and was a truly amateur effort with an assortment of written work, collaborative and individual comics and solo artwork included within its 40 pages. It is still being sold for $3.00 and there were 100 grayscale copies printed in it's first (and currently only) run and each was hand-numbered. Issue II was a long-form anthology zine released February 7, 2009 and was a much more cohesive effort with a focus on collaborative and individual visual art and no written work (aside from the three creators respective "My Life 2009" updates.) There were 40 pages as with Issue I but no specific numbering. It is still being sold for $3.00 and the first printing run was limited to 30 grayscale copies. Issue III was a long-form anthology zine released September 1, 2010 and the first two issues were given to Marilyn Manson and Jim Tozzi (of PFFR.) It was one of the the most successful ventures of Aorta VI at that point and featured the most extensive, expansive and elaborate comics yet released. All the comics were made in full-color but have yet to be released in that intended format. A grayscale copy retails for $3.00. The Red Sky was a single issue comic which was released concurrently with Issue II and was intended to be a more accessible entry point into the oddities of the collective and was sold for $1.00 (though most copies were given away for promotional purposes.) The first (and currently only) printing run was limited to 20 copies. 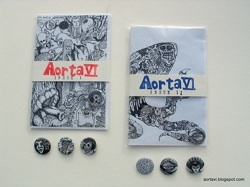 Aorta VI Collection A was a short-form anthology comic released before Issue III and was a collection of single comics that had been made over the course of 2009. It is also known as CHIRP! as the word features prominently in the cover comic. Terrible Twos is a two frame online comic strip (posted below in the External Links sections, as well as various other venues) started by Blunk and Kneisel in 2009. It began as a daily strip on December 29, 2009 and ran till April 29, 2010. After a 3 year hiatus it resumed as a weekly comic strip: Terrible Two Tuesday. Jared and Pj's Terrible Twos also featured an on going story called Suburban Wounds which focused on a random suburban household with an abusive father, a fat baby (referred to as RoundBaby) and a robot with no mouth. Jared and Pj have plans to expand said story in future endeavors. In 2009 Kneisel and Blunk went to a 24 hr. Comic Day event at The Comic Bug in Manhattan Beach, California and met fellow artist, Tyler Stafford. Kneisel and Blunk shared the intricacies of the Aorta VI machine and thus collaborative seeds were planted. Soon a new era would begin. The site AortaVI.com was soon formed as well as AortaVI.blogspot.com, and a new kind of Aorta VI began to take shape. Soon after Issue III's formation in 2010, Stafford's first contributions to Aorta VI were featured in Aorta VI Collections B, colloquially called Zonosphere as the word appears prominently in the cover comic. In 2011 one full color copy of A Day at the Zoo was made for Jim Tozzi. Shortly after this Graham went on a hiatus from Aorta VI to pursue flash animation under the name HeySamGraham. Work then began in earnest on Aorta VI (Zine) Issue IV featuring collaborative and solo work of Blunk, Kneisel and Stafford and it was released May 12, 2012. In early 2012 Blunk, Graham, Kneisel and Stafford met with Shia LaBeouf (who had been introduced to the collective through Kneisel) and began discussions on a brand new collaborative work. In July of that same year a publishing alliance with The Campaign Book was officially announced for the book Hotah. In May, 2013 Kneisel started a collaboration with Sean O'Brien which embraced the capabilities of digital in the zine format known as Myopic Puppies. This was soon incorporated under the Aorta VI brand. Issue I was a short-form anthology zine released on July 17, 2013. It differed from the usual Aorta VI style: shorter (at 12 pages), cleaner art, and laser focused on the dark and depressing aspects of the human condition. It featured art as well as short comics. Issue II was a short-form anthology zine released on October 11, 2013. It experimented more with the digital toning of the art work and further explored the use of single images to evoke a sense of unease. The smattering of comics featured were tighter and more professional looking than ever before. Myopic Puppies Monday - the collaborative works of O'Brien and Kneisel. Terrible Twos Tuesday - the two framed strip of Blunk and Kneisel. Why Bother Wednesday - the strip "Why Bother" by Blunk. Throwback Thursday - the unpublished and rarely seen comics from Aorta VI history. Freaky Friday - the strangest and most unusual outpourings of the collective.